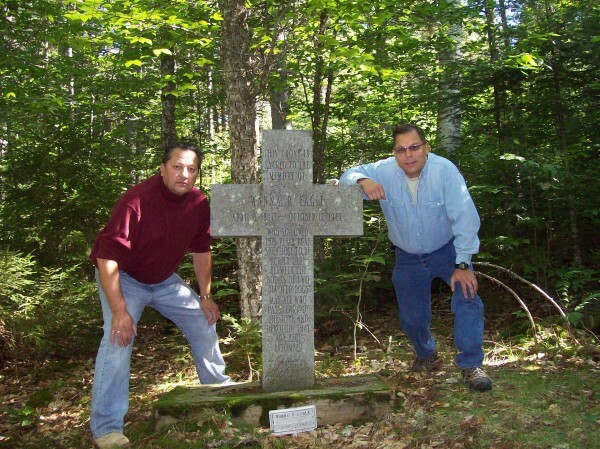 Houlton Band of Maliseets Rep. David Slagger, right, poses with Henry Bear, another Houlton Band member, at the gravesite of Wanna Eagle on Sugar Island. Eagle was the wife of Chief Henry Red Eagle, a Greenville native and first Native American graduate of Greenville High School. The man who represents the Houlton Band of Maliseet Indians in the Maine House is seeking recognition for another band of Maliseets in Maine, a move that he says will bring economic development to the Greenville area and acknowledge the Moosehead Lake region’s long Native American history. Rep. David Slagger’s effort to secure state and federal recognition for the Kineo Band of Malicites — who have also been known as the Moosehead Lake Indians — promises to be lengthy and complicated, and it’s not likely to attract enthusiastic support from the four Maine tribes currently recognized by the federal government. Slagger became the state Legislature’s first Maliseet tribal representative when he was sworn in in January. But frustrated that tribal representatives can’t vote on legislation, he said earlier this year that he would step down at the end of his term. He’s now running as an independent for the House District 22 seat, representing Corinth, Glenburn, Kenduskeag and Levant. The efforts to secure recognition for the Kineo Band of Malicites — another spelling for Maliseet — are in the beginning stages, Slagger said, but he has consulted with attorneys and says there’s sufficient history in the area to make a case for the tribe’s acknowledgement by both the state and federal governments. Maliseets began forming settlements around Moosehead Lake in the 1800s, after Chief Louis Annance of the St. Francis tribe of Abenakis left his tribe for what became Greenville, according to “Seboomook,” a 2003 history of the Moosehead Lake region by Everett Parker. Slagger says his grandmother lived in the area during the 1930s and that descendants from Annance and other Maliseet settlers still live in the area. The region’s full Native American history stretches back further. Mount Kineo, on the shores of Moosehead Lake, is well documented as a place where Native Americans traveled for thousands of years for flint — Kineo is a Maliseet word for flint — a material they used for arrowheads. Moosehead Lake was also along a key route Native Americans used to travel to Quebec to hunt. Slagger said he would seek to designate part of Mount Kineo and, potentially, Sugar Island as the Kineo Band’s tribal areas by negotiating with the state, which currently owns the land. He recently visited gravesites for Maliseets in Greenville and Sugar Island, Moosehead Lake’s largest island. “Because there’s a historical record of them living there, being born there and dying there, and because there’s an existing form of government, that meets the criteria for federal recognition,” Slagger said. Proving a tribe’s history in an area is a critical part of the often years-long process of securing recognition from the federal government through the Bureau of Indian Affairs. Tribes seeking federal recognition also must prove a community of tribal members exists and provide a list of members. The last tribe in Maine to secure federal recognition, the Aroostook Band of Micmacs in Presque Isle, filed its petition with the federal government in 1985 and secured recognition six years later through an act of Congress. Another Maine tribe, the Wesget Sipu in Fort Kent, started the petition process in 2002 and has yet to receive recognition. Maine currently has four tribes with federal recognition: the Aroostook Band of Micmacs, the Houlton Band of Maliseets, the Penobscot Nation and the Passamaquoddy Tribe. Federal recognition would allow the Kineo Band of Malicites sovereignty over a particular territory and qualify them for federal funds through the U.S. Bureau of Indian Affairs. It would also allow construction to take place in the area as a way to promote tourism, Slagger said. “It would bring a lot of construction jobs and, I think, an economic boost to the area,” he said. In addition to federal recognition, Slagger said he’s planning to propose legislation that would make the Kineo Band of Malicites the first tribe recognized by the state of Maine. Maine’s current recognized tribes have federal, not state, recognition. If he doesn’t win his House race, he said, he’d work with some of his current legislative colleagues to introduce the bill. As he discusses recognition for the tribe, Slagger said he’s finding more support among his non-native legislative colleagues than among Maine’s existing tribes. Recognition for the Kineo Band could hold some economic benefit for the Greenville area, said state Rep. Peter Johnson, R-Greenville. Representatives from Maine’s tribes contacted by the Bangor Daily News were less certain about supporting recognition for another tribe. It will be difficult to make the case that another tribe qualifies for federal recognition, said Richard Getchell, chief of the Aroostook Band of Micmacs. Since Slagger is trying to secure recognition for another band of Maliseets, it should be an internal matter among the Houlton Band of Maliseets, said Slagger’s fellow tribal representatives in the Legislature, Passamaquoddy Rep. Madonna Soctomah and Penobscot Rep. Wayne Mitchell. Soctomah said she has been focused in the Legislature on making sure that state resources available to members of Maine’s four recognized tribes aren’t wrongly used by non-tribal members. She sponsored a successful bill in 2011 that stripped Wesget Sipu members of their rights to receive free hunting and fishing licenses, a privilege afforded to members of Maine’s four recognized tribes. “We’re constantly addressing issues of private organizations that want to appear to extract resources and draw some kind of attention for monetary reasons that continually misrepresent the recognized tribal population within the state,” Soctomah said. Houlton Band of Maliseets Chief Brenda Commander said she doesn’t know much about Slagger’s effort to secure recognition for the Kineo Band. While it’s far from certain the Kineo Band would receive federal recognition, she said she’s concerned about the potential for existing federal resources to be spread even more thinly. While Maliseet history in the Moosehead region has been documented, it might be more difficult to prove there’s much of a Maliseet population there today. Francis Tomer, who lives in Rockwood and whose father was Maliseet, said he didn’t know of many Native Americans living in the area. Historically, many Native Americans passed through the region, but didn’t end up staying, said Tomer, who’s registered with the Penobscot Nation at Indian Island. Nonetheless, he said he’d support Slagger’s effort to receive recognition for another band of Maliseet Indians. It would be a way to bring more tourists to Mount Kineo, he said.